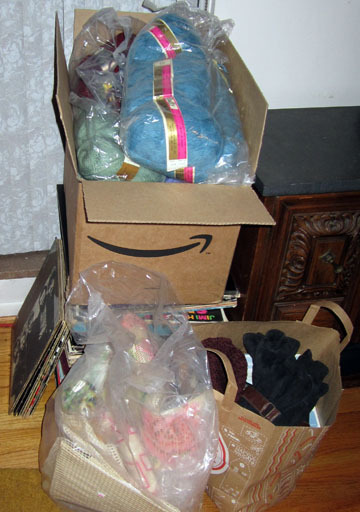 Alright, so last year, I made a resolution to not buy yarn or fabric, and I didn't buy much yarn (3 skeins!) but I bought fabric uncounted, and I am not repentant, as I rediscovered quilting, and what can you do? Secondly, I made a giant list of projects I meant to do last year, and I did maybe a third of them? Sewing for kiddos: pajamas for child B, for child A a bathrobe, another skirt, and perhaps a dress. Sewing for me: one skirt. Quilting: Finish the outstanding projects, then work on a few small art quilts - specifically to master curves. Weaving! I have done so little weaving this year, it's sad. I have a project on the loom now that I hope to finish soon and then start churning out some dishtowels to replace old unexciting mass produced ones. If I get through those, I'd like to move on to rag rugs. Spinning: Another hobby I have been neglecting. I have decided on a goal of spinning at least two yarns per month. Sewing room revamp: it is in sad shape, sadder still because this was on my list for last year! Apart from addressing the obvious flooring problem, I want to rearrange furniture to work in a place for an ironing board and move the office stuff out, and bring my fabric stash back in. Destashing! I want everything to fit somewhere out of the main room without all the current overflow. I've already got this underway, I've cleared out latch hook stuff, some yarn, some roving, a third of my sewing patterns, and the bulk of my record collection. Also going are many pairs of jeans I got off someone on Craigslist, since they'd just been sitting around here for a year and a half without my doing anything much with them... There is more to go, I'm sure; I'm in a getting rid of it sort of mood. I'd also like to do more yarn and fiber dyeing, but I'm not promising anything. Things are going to be a bit different here in the new year, but more on that later.